Jeff Nichols writes and directs this almost-timeless looking drama that focuses on Alton (Jaeden Lieberher) a boy who is clearly different to other children. 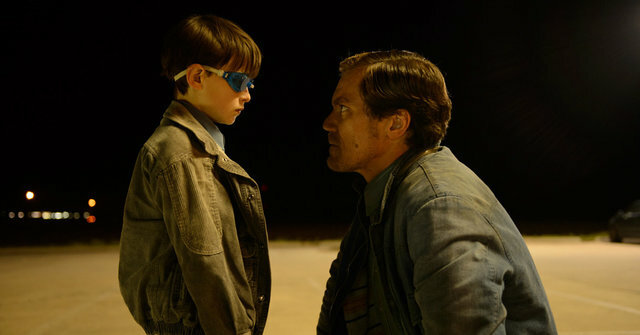 Tireless efforts are made by his father and mother (the always-reliable Michael Shannon and Kirsten Dunst) to keep the boy safe, whilst they take him on the run. From this point on, we are drip-fed narrative elements that shed light onto why Alton is in this situation. It soon becomes clear that he possesses some very special powers indeed. 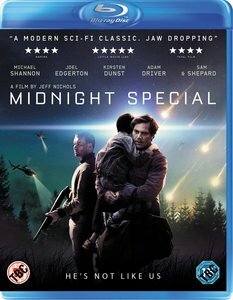 As a chase movie, Midnight Special works very well, with some fascinating set-up that makes the audience work for its answers. The slow reveal does this sci-fi story the world of good as we learn why Alton is different. Introducing Adam Driver midway through the film also changes the pace of the film, when time then shifts the films focus. And this is where the film doesn’t deliver as it should. The slow burn worked well to a point but I felt the rest of the narrative rushed by and didn’t provide the answers it probably should. Whilst I’m all for stories that make the viewer draw their own conclusions, some more context could have done this the world of good. Solid support comes from the likes of Joel Edgerton and Sam Shepard, guaranteeing a movie made of quality parts throughout. But it’s Shannon and Dunst that deserve the most praise here. Dunst has always delivered captivating turns, but her restraint and sorrow really gives the film a massive emotional kick. The same can be said of the perennially outstanding Shannon, whose interactions with Jaden Lieberher are always heartfelt and sincere. A Starman for a new generation, Midnight Special has lots of great elements but there’s still something lacking in the story. Despite this, it’s still a rewarding watch with an ending that creates one of the most visually stunning finales in recent sci-fi memory.